Objective: Our Country is celebrating 75th anniversary of ‘Quit India Movement’. Against the atrocities of British Government, the youth and the countrymen pledged on 9th August, 1942 to oust Britishers and showed courage and sacrifice and fought till 1947, untilthe country achieved Independence. 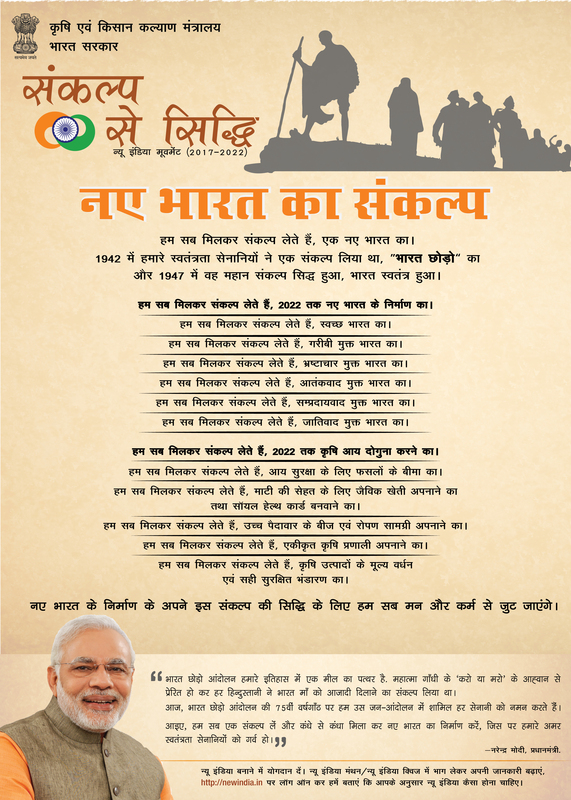 Since then, 1942 to 1947 is always remembered as the Great Movement (Sankalp Se Siddhi). Krishi Vigyan Kendra Seoni (M.P.) successfuly organised Sankalp se Sidhi programme on 23/08/2017 at New Sabzi Mandi premises Nagpur Road . More than 850 farmers & farm women and 147 officers were present on occasion. Officers from agriculture and allied department were also present. Honorable Member of Parliament Shri bodh Singh Bhagat was the chief guest of the programme. Dr P K Singh Director ICAR DWR delivered guest lecture on the ocassion.